If you are unhappy with any of our products, simply let us know within 30 days of your order, and we will refund your purchase. Licence: GPL. See all the benefits. 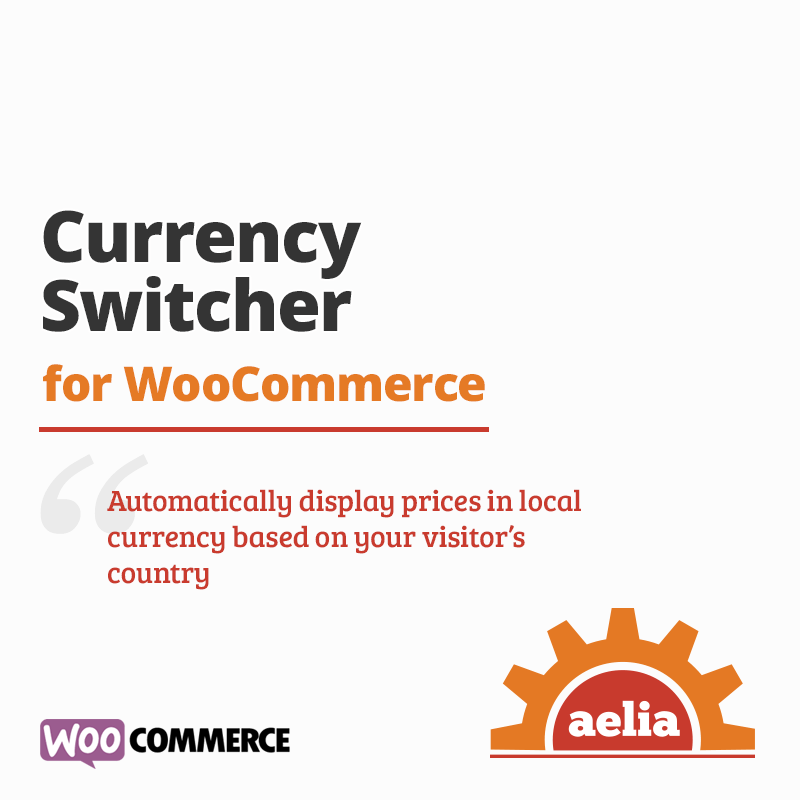 Currency Switcher for WooCommerce allows your shop to display prices and accept payments in multiple currencies. This will grant your customers the possibility of shopping in their favourite currency, thus increasing conversions. Should you have any questions about this product, please have a look at the Knowledge Base, or feel free to contact us. Currency Switcher for WooCommerce allows your Visitors to select in which currency they would like to see your prices, as well as complete transactions in such currency. Once enabled, the Currency Switcher will allow you to configure a list of the currencies you would like to accept. Such currencies will then appear in a list, displayed as a widget, which your Users can use to choose their preferred currency. When a customer selects a currency, the shop will be both displaying prices and completing transactions in the new currency. The prices displayed on the shop will be the ones that the customer will pay upon completing the order. Credit Card operators often charge a conversion fee when a payment is made in a currency different from the one for which the card was issued. This adds an extra cost on every purchase, and it can discourage prospective customers. Giving your Visitors the possibility of paying in their currency can help improving conversion. Every order will store the currency used to place it, so that both Shop Managers and customers will be able to retrieve it and see how much they paid. Your ability to accept payment in each currency will depend on the Payment Gateway plugins installed on your site and on the Payment Processors you use. If you are unsure, we recommend that you contact them to verify that they will be able to process payments in the currencies you would like to accept. The Currency Switcher for WooCommerce includes GeoLite data created by MaxMind, available from http://www.maxmind.com. Releases are announced via blog posts; you can subscribe to the site feed (use the form which you can find on the right, on the front page) to be informed when new updates are available. Easy to use for both merchants and customers. Allows customers to shop in their preferred currency. Automatic update of exchange rates, via Open Exchange Rates, WebServiceX and Yahoo! Finance (more providers coming soon). Allows to set exchange rates manually, instead of having them updated automatically. Allows to enter prices in each currency for products and coupons, without having to use an exchange rate. Allows to set a base currency for each product, and calculate prices in other currencies automatically. Automatically detects of visitors’ country (geolocation), with currency set accordingly. Filters available payment methods depending on the selected currency. Visitors’ preferred currency is persistent and it will be selected automatically at their next visit. Integration with the multi currencies feature of Google Analytics. Allows to automatically select a currency based on customers’ billing or shipping country, rather than letting them choose it explicitly. Comes with free integrations with some of the most popular WooThemes plugins, such as Subscriptions, Product Add-ons, Bundles, Composite Products, Dynamic Pricing, and more. Fully supported by the WooCommerce Points and Rewards plugin, by wpweb. 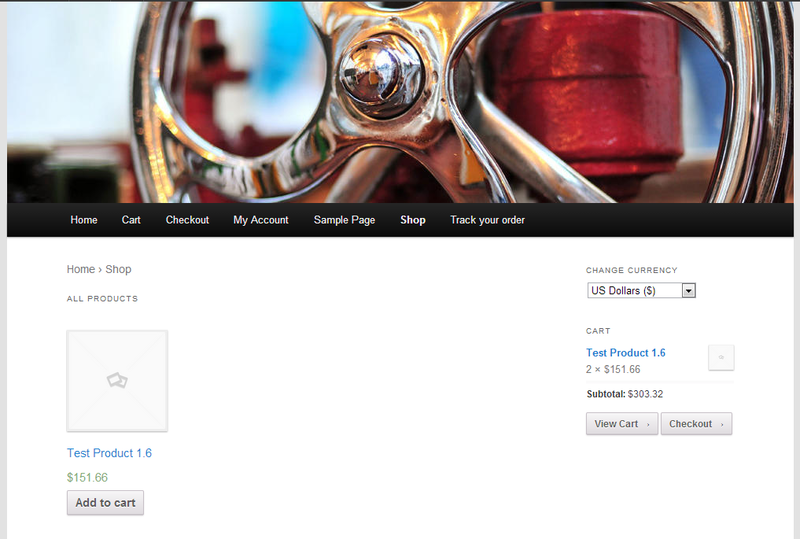 Fully supported by the Product Feed PRO for WooCommerce, by AdTribes. Fully compatible with our WooCommerce plugins. Free Aelia Foundation Classes framework 2.0.1.180821 or newer (the plugin can install the framework automatically). Recommended: PHP and WordPress memory limit set to 128MB or more. We would like to thank David Anderson for his suggestions and feedback, which greatly helped us in improving our product. Below you can find the change log for the most recent releases of the plugin. Should you need information about older releases, please feel free to contact us. Tweak - Added validation of product ID before trying to fetch its currency prices and perform a price conversion. Tweak - Added check on frontend script, to handle the case where the wc_cart_fragments_params variable has been removed by disabling WooCommerce's cart fragments. Feature - Implemented Bulk edit for simple and external products. Tweak - Rewritten logic to handle the price filter widget, removing legacy code. Improved compatibility with WooCommerce 3.5.2. Fix - Updated "product is on sale" check, to take into account the time zone. Fix - Modified currency selector widget to show warning about "force currency by country" option only on the frontend. Feature - Added support for exchange rate markups expressed as a percentage (e.g. "10%"). Updated requirements. The plugin now requires Aelia Foundation Classed 2.0.1.180821 or newer. 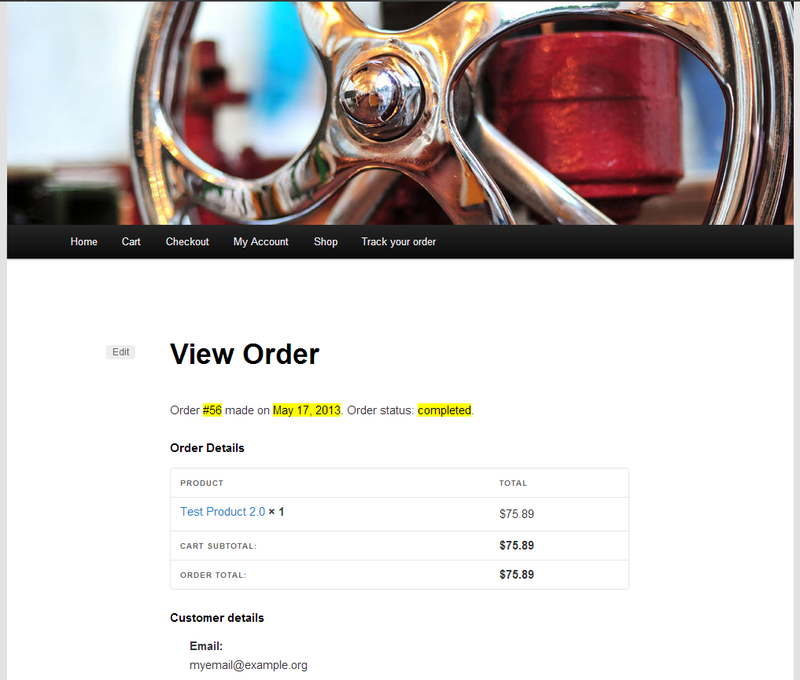 Feature - Added order net total in base currency next to the order total, in Orders List page. Tweak - Implemented "lazy load" of exchange rates provider models. This is to allow 3rd parties to hook into the logic and add their own models. Tweak - Removed warnings when the price properties expected by the Currency Switcher are not found. Fix - Fixed bug that caused the exchange rates settings to be lost after removing a currency. Tweak - Implemented workaround to prevent the Memberships plugin from triggering notices during the conversion of product prices. Tweak - Added logic to ensure that shipping costs are calculated with the correct amount of decimals, before they are converted. Fix - Set currency for Latvia to EUR. 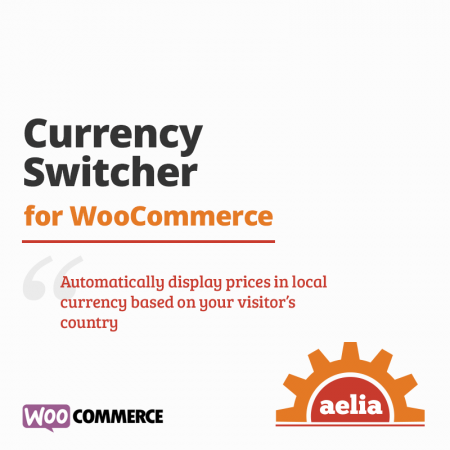 Aelia’s Currency Switcher is really the only working currency switcher plugin for WooCommerce. Code quality, options range and support responsiveness are totally worth the investment. Great plugin – excellent support and extendability. Thanks Diego! The best currency switcher for woocommerce i have ever used, the perfect one and great support from team member Mr. Diego. The team at Aelia have been awesome in developing this plugin to help expand international sales for our company. Diego has been amazing in his response and I plan to make a purchase on the other complimentary plugins due to their prompt response to our enquiries. 1) I recall Woocommerce and Zapier came out with a plugin which you’ve mentioned on Twitter. Would you know if Woocommerce + Google Sheets via Zapier will log all of the sales in each respective currencies that the Currency Switcher supports? 2) Do you know of any easier method of editing prices in each currency and stock counts of simple and variable products that’s compatible with the Currency Switcher plugin? I would be open to suggestions as we continue to scale and grow our website and will need an easier way to mass update prices in multiple currencies and stock count. Was looking at this plug (https://codecanyon.net/item/woocommerce-advanced-bulk-edit/8011417) but wasn’t sure if it can cause a conflict. Thanks again to the team at Aelia! We haven’t tried the Zapier integration ourselves. As long as it takes the currency from the orders, then the tracking of orders should be correct. I would recommend to contact the developers of the Zapier/Google Sheets integration, they should be able to verify that for you. 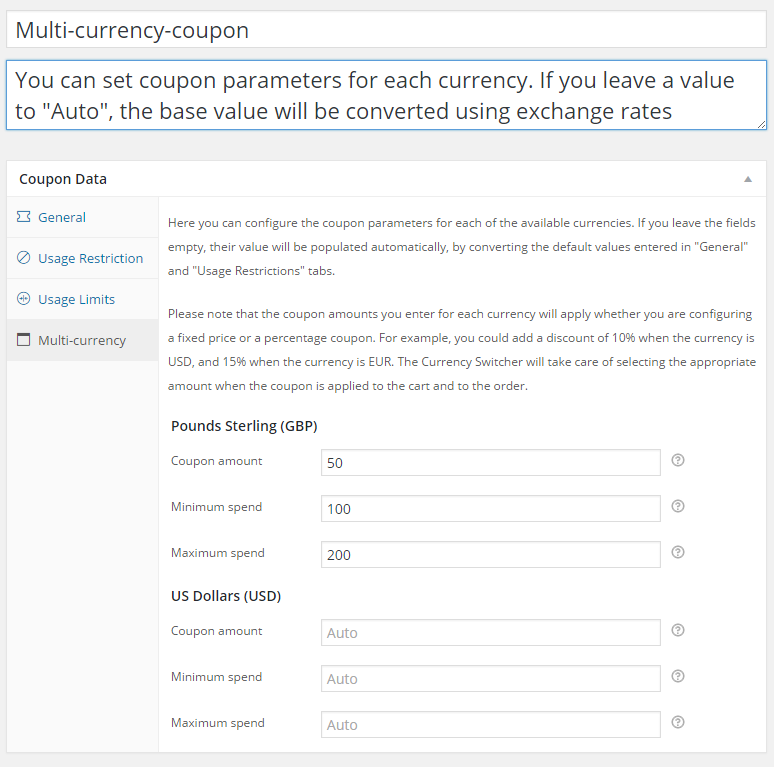 The Bulk Edit plugin you indicated doesn’t seem to indicate support for our Currency Switcher, therefore I would guess that it’s not aware of the multi-currency prices that our product adds. You can ask its authors if they are planning to add multi-currency support to it, and they can contact us directly if they have any questions. In the meantime, a solution to alter product prices would be to export the products to a CSV file, alter them, then import them back into the database. As long as such products are stored in the appropriate format after the import, the Currency Switcher will pick them up automatically. You can read more about the import/export of product prices in the following article: Where are products’ currency prices stored and how can I import them? Hi Sameer, thanks for your enquiry. We haven’t tested the One Page Checkout plugin ourselves. Based on its description, it should not affect the price calculations, therefore it should work fine with the Currency Switcher. If you would like to try the two plugins together, all orders made on our site are covered by a 30 days money back guarantee. That will give you a full month to test the Aelia Currency Switcher and the One Page Checkout plugin together, before deciding to commit to the purchase. The Aelia currency switcher is a must if you sell in different currencies. We have been using it for years now and I can not recommend it higher. We have needed support from the developers once on a caching issue due to the servers that the site was running on. And support was fast and effective. This truly is the one and only currency plugin you should be considering! It’s been fantastic for our international website and the plugin works well with other plugins like woocommerce PDF invoices – plus the team at Aelia have been super-fantastic to assist in all circumstances. Top rated developers who know their stuff! Are there any plans to support that converter in the future? We haven’t added support for the XE API yet because it would require a subscription, which has a minimum price of $799 a year. That makes XE too expensive for most of our customers to use. If that will change in the future, we will surely add support for the XE service. As an alternative, the Currency Switcher supports Open Exchange Rates, which includes a free tier. Its rates fairly close to the ones from XE, and it could be a good replacement for it. We are looking for a plugin which will detect the Geo location of the customer and automatically shows the currency and the supported payment gateways with respect to that country instead of the user selecting the currency options for one of our Shop Website(https://shop.kinduz.com/). Our shop website is built on wordpress with Flat some UX theme and woo commerce as the shopping cart. Can you please help us in selecting the right plugin which can do the work for us and also supports our environment. For example if the user is accessing the shop website from USA, Egypt, UK locations, then the site has to show the products in the Dollars(as pricing) with PayPal as the payment gateway and if the user is accessing the site from India, then it has to show the products in INR (Indian rupee) with Paytm, CC Avenue as payment gateway. And also the currency rates has to be updated regularly by using any API(google, yahoo, exchange rates), so that we dont need to update the rates on daily basis. Look forward to quick reply. Enable USD and INR as your currencies. Enable the automatic update of exchange rates using Yahoo! Finance, or Open Exchange Rates (free API key available from their site). Enable the geolocation feature, setting USD as the default currency. Customers from India will see INR, whereas anybody else will see USD. Force the selection of the currency depending on customer’s billing or shipping country (see https://i.snag.gy/kAqWOS.jpg). With this option, if the customer will change the country at checkout, the currency will change as well. In the Payment Gateways section (see example: http://prntscr.com/f7d7pq) enable PayPal for USD, PayTM and CC Avenue for INR. The above setup will cover all the requirements you describe. Should you have any further questions, please feel free to contact us. Thanks for your interest in our products. By far the best Currency switcher plugin for Woocommerce. Packed with a lot of features and with a few add-ons, which help with other tasks that are optional but sometimes necessary. Keep it up. This plugin saved the day. I tried pretty much all the others and wasn’t happy with them. Currency Switcher is working really well for us on a big client site. Support was extremely fast when we had an issue (which turned out wasn’t due to this plugin). Thanks Aelia, will def recommend. Great and Impressive Plugin , easy to use with amazing features and functionality. I highly recommend everyone to use this plugin without any second thought. I was stucked with some issue regarding currency converter but hats off to support team, they were constantly supporting me and able to solve the problem.Looking forward to use other plugins too. 1) Does the plugin work seamlessly with Stripe & Paypal gateways? 2) Is there a way to add a currency switcher icon or selection on every single product page? I see that the only way to switch currencies is to use the widget on the sidebar, but my product pages don’t have a side bar, and i’d like to make it as simple as possible to switch currencies without relying on sidebar widgets. 3) I’m using siteground for hosting, i’ve used their plugin .. it didn’t speed up the site as much, i also don’t think Aelia Cache Handler plugin will help either. Which caching plugin do you think is best for woocommerce & why? Thanks for your enquiry. Please find the answers to your questions below. Our Currency Switcher works works perfectly with Stripe and PayPal. They are the payment methods we accept on our site. For completeness, our plugin works fine with any payment gateway, as it doesn’t interfere with the payment process. The only requirement is that the gateway must be able to process orders in the currencies that your site sends to it. How to show the Currency Selector widget anywhere. How to create a currency selector in a navigation menu. The Aelia Cache Handler is not designed to speed up the site, but to work around the limitations of rigid caching systems, which don’t support dynamic caching. The SiteGround caching is one of such systems. If you need a caching plugin, we would recommend WP Rocket or Comet Cache (either free or paid). They both provide excellent performance, and they both support dynamic caching. WP Rocket supports our plugins out of the box, while for Comet Cache you will need to use our free Advanced Caching Addon. Love this product. We’ve seen an increase in international orders when our customer can pay in their own currency. Had some issue with our cache and price display at first, but the ajax cache handler solved that. Thanks! Thanks for your feedback. One suggestion about the cache: W3 Total Cache is not the best solution when you need dynamic caching. The Aelia Cache Handler plugin is provided as a workaround for when you have no alternative, but a much better option is to use a caching plugin that supports dynamic caching, such as Comet Cache (which is what we use on our site) or WP Rocket. Both of them are excellent solutions. For more information on how to use them, you can refer to our knowledge base: How to add dynamic caching to your site. Excellent customer service, easy to integrate. This is an excellent product and the support by the Aelia team has been fantastic since we first started using it two years ago. Thanks for your kind feedback. We are proud of having you as a customer, and we would like to thank you for the valuable feedback you provided us. We wish you the greatest success with your new, multi-currency site! THis plugin is rock solid, if you need a multi currency store this is a huge must! Support is as good as it gets, Diego responds quickly and obviously knows Woocommerce and the plugin inside out. This plugin saves me lots of work updating my products, every time the currency rate is changing – very cool. Support is excellent and prompt. Add the currency rate to the order as a private note so we can reference what the rate was when the order was placed. A lot of times customers will mention that the price is higher this time, why? I will say well the currency has changed and many times they don’t believe it. Would be good to have those numbers to reference. Thanks for the suggestion, we will review this new feature. In the meantime, you can easily calculate the exchange rate applied to an order from the order metadata, as described in our knowledge base: How to retrieve the exchange rate applied to an order. You will just have to make sure that, if the exchange rate is not valid (e.g. because the Currency Switcher was not active when the order was placed), your code returns an exchange rate that is meaningful to you. I think your plugin may the missing piece of my website. But I have a question before I buy this plugin. I am using wpml to built a multi language commerce site.I would like to use the detect ip function to force user to see the product price in their home country currency. Let say , American visit the website , they can choose to see the website in different languages , but the product will only show in US dollar. That would be perfect if your plugin support this setting. The Currency Switcher includes a geolocation feature. Once enabled, the plugin detects visitors’ location and show prices in the appropriate currency automatically. Please note that the geolocation feature included by our Currency Switcher, and all our other plugins, is independent from the one provided by WooCommerce and, in our opinion, is more “cache friendly”. You can read more about this aspect on our site: WooCommerce Currency Switcher and cache – Making them work together. The plugin works like a charm and the support is top notch! It will make it possible for our nordic neighbours to shop at our store (secrets.se) very soon!! Thanks for your feedback, Jimmy. We are glad that our plugin met your needs, and we are looking forward to see it in action on your site! Currency Switcher was a game changer for PrintSolo.com, making it into a truly international marketplace. We love it and our vendors love it as it makes domestic sales for them much more likely. It was very easy to install and has worked perfectly ever since. Hi Ilaria, thanks for your feedback. We are glad that our Currency Switcher is working well for you. Indeed, we endeavour to provide the best internationalisation solutions on the market, and we are happy to see that they helped your WooCommerce shop to reach a global audience! Is your plugin compatible with BeanStream? Our plugin works with any payment gateway, and it’s compatible with Beanstream. We have several customers who use that payment processor. You will just have to make sure that your Beanstream account is configured to accept multiple currencies (their support team can help you with that). Should you need to use multiple Beanstream accounts, we can also customise the gateway for you for that purpose. Please feel free to contact us for more details. This plugin is amazing! It works beautifully and simply from the front-end, and it’s got a thorough selection of settings options. Anything we wanted to do was possible. I was also completely blown away by the support. Fast and so helpful! Is your plugin compatible with PayPal Express? I’ve tested some others which display a different price in the cart to PayPal Express’ checkout. Our Currency Switcher works fine with the PayPal Express plugin sold by WooThemes and the PayPal for WooCommerce plugin (we worked with the author of the latter, months ago, to ensure compatibility). Generally speaking, our plugin can work with any payment gateway, because it doesn’t interfere with the payment process itself. The only requirements are that the payment gateway must take the correct order currency and, of course, the payment processor must be able to accept payment in that currency. hello, i would like to know please how the plugin save the currencies data? does it use session? as i may have problem with my server in regard this, just want to confirm please. Just before I purchase, I wanted to confirm that you can set the prices of products individually in different currencies, i.e. USA $15, UK £5, AUD $20 etc for one product? This is a brilliant plugin that solves a lot of core issues for a global online retail platform. The support team headed by Diego works like swiss clock. They solve issues and suggest ideas to approach each problem in a better way. It’s the best solution out there for currency juggling and keeping the site user friendly. Hi! Does the base currency work for variable products only in woocommerce 2.3? Does it work in the newest versions as well? The product base currency is fully compatible with WooCommerce 2.4.x,and it works with both simple and variable products. Great plugin, great product and best of all – amazing service. They were quick and thorough, attending to all my questions immediately. Well done, Aelia Team! I’m currently using another currency switcher plugin but I’m having problem with TM Extra Product Options. The problem is that the total price after adding extra option doesn’t change. Do you think your plugin would be able to fix this? 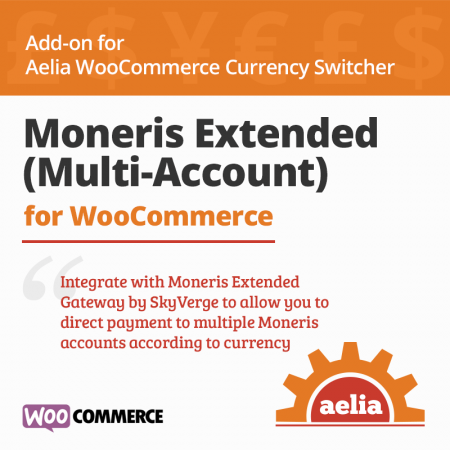 – Added compatibility with Aelia Currency Switcher with multi currency support. The integration ensures that product options’ prices are converted correctly. It also allows to enter a different price in each currency (e.g. 100 USD, 95 EUR, 90 GBP), instead of using automatic conversion. Highly recommended. Works just as described. I set it to use automatic currency conversions through the plugin which works a charm and fetches the exchange rate of the currencies added to the store’s main currency. Also was able to use the Geo feature to then swap the prices to the visitor’s country currency (and also a drop down for people to toggle the currencies), and then attach a specific payment gateway set up in WooCommerce to be used with that currency via the plugin. Fantastic alternative to using a full WPML install (which doesn’t fetch exchange rates), and also very easy to set up. This plugin is a must if you want your store to be able to convert currencies – just as it says on the box! Support is very responsive as well. These guys are pro. The plugins they’ve made work seamlessly and open up a new world of e-commerce options for regular users. Further to this, their support is the best I’ve dealt with. Seriously I’ve worked with a bunch of plugin authors over the past few years and Diego and Aelia support are second to none. I purchased this plugin almost a year ago and I just had a problem now. I confess I was in despair, because prices were not correct so I sent an email for support asking for help. Diego was really nice to me! He found that I had to update the plugin because automatic updates were not working. I couldn’t be more happy with the support service, it was really fast and efficient! It’s a great plugin and I highly recommend it, will definitely keep purchasing it. Great job! Any product is only as good as its support. 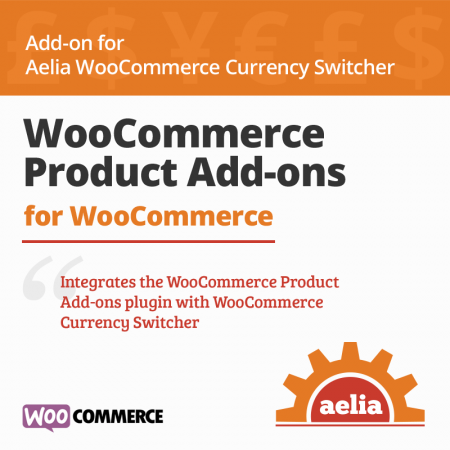 With Aelia’s Woocommerce currency switcher I found exactly what I need – features that enable me to sell in any currency and a perfect sync with the EU VAT assistant. Plugins are straight forward to set up. Documentation of the plugin is pretty detailed with all the information needed to assimilate the plugin into the theme as a native widget. Plugin is regularly updated. Aelia’s support is top notch in terms of clarity and to the point. Support team provided me with screenshots and ideas that simplified by job. This is a great plugin. It just works. Simple to set up (about 10 minutes) and worked well. Currency selector seemed to style according to my theme too. You can also set currencies for specific products too which is what we needed. Great job. I have few items that I import to order from the EU and would like input the euro price and for a product, and for it to then update the Pound price. Is this possible with this plugin, or do I still have to input the default currency (£)? The Currency Switcher allows to set a base currency for each product (see screenshot). 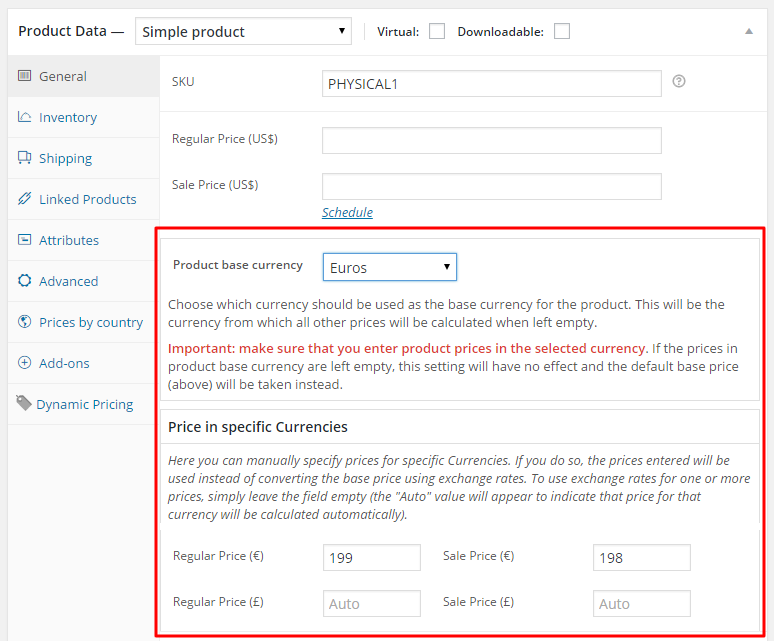 If you set a product’s base currency to EUR, you will be able to enter the EUR prices for that product and have the GBP prices calculated automatically (unless you decide to enter them manually, of course). Currently, this feature supports Simple and Variable products. Do you think if this plugin will work with DOKAN plugin ?? Thanks for your enquiry. The Currency Switcher should work fine with the DOKAN plugin. We haven’t tested it ourselves, but, as far as I can see, the purpose of that plugin is to run a multi-vendor marketplace, and it should not interfere with the multi-currency features. If you would like to try them together, please keep in mind that all our products are covered by a full 30 days money back guarantee, for complete peace of mind. Should you have any further questions, please feel free to get in touch. Thanks for your interest in our products. This Currency Switcher plugin addressed every need I had as my company signed up for a multi-currency merchant processing account, and wanted to process bank cards in the appropriate amount in the selected currency, on our website. The plugin delivered on all expectations, as we have actually been processing in more than 12 currencies, with no issues (due to a considerable amount of pre-launch testing). Additionally, the support has been amazing, as Diego was able to respond to all questions, even when they ended up being peripheral issues. There are a lot of considerations with building multi-currency processing on a website, but I would not hesitate to say that buying this plugin is the next step if you have the need and ability to process in multiple currencies, but have not yet configured it on your WooCommerce site. We are planning on using Stripe to process payment. We need to be able to take CAN, USD and Pounds, in the same process. will this plugin work with Stripe to process the chosen currency? Our original answer seems to have disappeared. Yes, the Currency Switcher works fine with Stripe. We also use Stripe on our site, and everything goes smoothly. Great and fast support! Does what it promises! This plugin is filling a massive hole in WooCommerce. It works perfectly and there are no words to describe how great the support is. Diego responded very quickly with support at all hours of the day and even pushed an update out within an hour to ensure my site was configured properly. AMAZING! The product is great, I use it linked to other plugins also. The support is awesome also. Keep it working like this. works fine, fast support. keep it up, Diego. I have already bought the Currency Converter Widget which as you mentioned is only cosmetics currency convert and didn’t do my job. So, now I am turning to your plugin. I need the woocommerce automated emails to be in different currencies too. Will I get that with your plugin? Do I also need to buy the WooCommerce Print Invoices & Packing Slips? Frankly, I would rather not, because I have set up all my emails as is. With our Currency Switcher, the emails sent by WooCommerce will contain the information in the currency in which orders were placed. You don’t need any additional plugin for this, it’s a core feature of the plugin. I want to set a store to show the currency for base country for those visitors, and USD for all visitors from other countries, limiting checkout to be in USD for all others and the local currency only for locals. Is this something that can perhaps be done with this plugin automatically based on visitor IP address? The Currency Switcher allows you to do what you describe. You can set the base currency to ZAR, then enabled only USD and set USD as the default currency for geolocation. This way, whenever a visitor will come from outside South Africa, he will automatically get prices in USD. If you also wish to force customers outside South Africa to pay in USD, you can do so by using the “force currency by billing country” setting. With such setting, the currency will automatically be forced to the one in use in the country selected at billing (if enabled, like ZAR and USD) or to the default currency you configured (in your case, USD). Hi Diego, Can I please confirm, does it automatically detect the visitors IP and show only their currency, (so they do not have to select it). Can you tell me how is it different to ‘Smart Currency Converter for WooCommerce’ by code hound? Thanks. Yes, the Currency Switcher can automatically detect the visitors’ currency and show them the related prices, if such currency is enabled. You can still allow your visitors to change it, if you like, but you don’t have to. The main difference between the currency converter you mentioned and our Currency Switcher is that the former just displays prices in other currencies, as a reference. With our product, orders are always completed (i.e. paid) in the active currency. 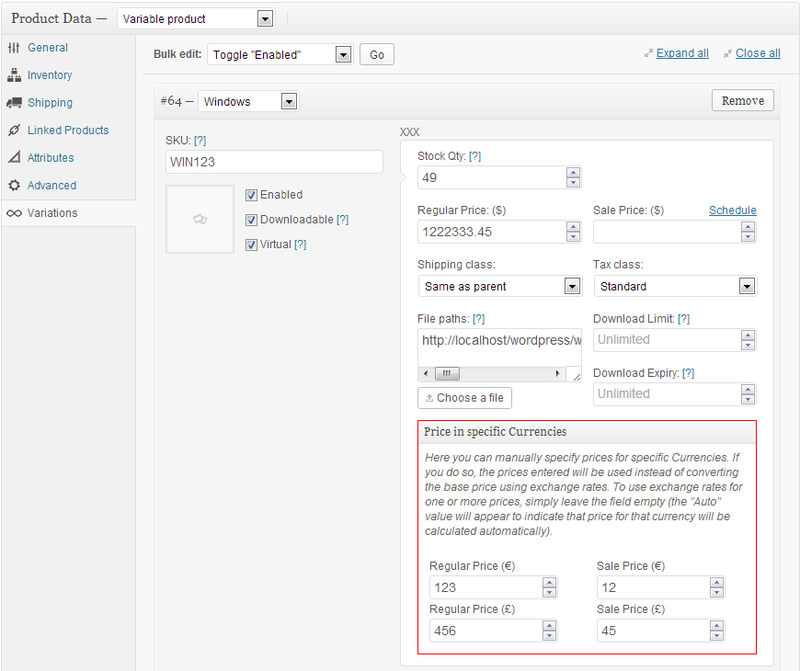 Another key aspect is that, with our Currency Switcher, you can optionally set product prices manually (e.g. 10 USD, 9.50 EUR, 9 GBP) instead of relying on exchange rates. This gives you great flexibility to manage your WooCommerce shop. Hi Eric, thanks for your comment. If you want to avoid conversion charges entirely, then you will probably have to have a bank account in each of the currency you would like to accept. If you plan to use PayPal, our PayPal Standard Multi-account plugin extends the PayPal gateway included in WooCommerce and allows to redirect payments to different accounts, depending on the currency. If you use PayPal frequently, that may be more convenient than having multiple bank accounts. Finally, the Currency Switcher also offers the possibility of adding a markup to each exchange rate, so that you can mitigate the cost of conversion while keeping a single account. Not only does this plugin fill a gaping hole in the ecommerce market, but Diego’s quality of support is of an incredibly high caliber. The words, “This guy is a rock star!” have been said in reference to Diego several times around our office, and we sincerely mean it. You can purchase this plugin knowing that there is a great knowledge base and support available to help get you up and running. Awesome plugin that has improved my site and made my customer experience so much better. The best and most cost effective currency switcher i’ve seen and easy to add to your site. Diego was also unbelievably helpful when I had any questions, I couldn’t recommend buying from him more. Very useful plugin with amazing support. Solved & new files received in one hour after submiting ticket and on Sunday(!). Thanks! I’m contemplating of buying this plugin but my concern is its compatibility with the current version of WPML and Woocommerce with its built-in currency_switcher. What are the working advantages of this plugin? The Currency Switcher works with WPML, but you would have to turn off the multi-currency feature as it will conflict with our plugin. Although I don’t know in detail how the WPML currency switcher works, I can tell you that one of the key features of our product is that it allows customer to complete orders in the desired currency (i.e. prices are not just displayed as a reference, they are used ). Also, it allows to specify prices manually for each product, rather than relying on exchange rates. There are several other important features, which you can find on the product page in the Key Features section. Should you have any further questions, please feel free to contact us. Thanks. This is such a life saver, and something that really should be built-in to WooCommerce! It is, though, missing one small feature that would garner it a 5-star rating. When you configure the store currency, WC gives you the option to customise the positioning of the currency symbol – eg, in the UK the “£” goes before the amount, but in Sweden the “kr” goes after. I would like to see the same functionality in this plugin. Other than that, it’s pretty much perfect for my need! Thanks for your feedback. The currency formatting was a feature we had in the list, which we had to postpone due to other high priority tasks. It will probably be released as an external plugin, so that only users who actually need it can install it. At the moment, we are focusing on improving the flexibility of the system implemented by the Currency Switcher (see the “Add-ons for the Currency Switcher” section in our shop), but we will definitely get back to it. 01. Our site will operate in https:// mode in some store pages. OpenExchange serves in http:// but have charges for https:// as you know. Is it same for WEBServiceex? 02. If so, will we have to pay to any of these providers for https:// serving or there is any free alternative that could be incorporated with this plugin? Based on our experience, other feedbacks here and your caring responses, providing 5 stars before using it. The fact that Open Exchange Rates uses HTTP won’t have an impact on your site, you can keep using HTTPS. The connection to Open Exchange Rates occurs in the background, your visitors won’t be affected and there won’t be any security issue. We do not recommend to use WebServiceX because it has become unreliable lately, we keep it in the plugin just for backward compatibility. Hi, Stripe now accepts 132 currencies even my stripe account is in USD they will accept any currency and deposit to my usd acccount in usd, so will this plugin help me accept any of those 132 currencies that STRIPE accepts now? In short, yes, the Currency Switcher allows you to accept any currency. You might have to add some of them to WooCommerce if they are not included in the core, but it’s a very easy task. You can see they have a language switcher in top right corner. I want to replace that with my currencies instead. Is this possible? The look of the currency selector can be customised via CSS, and you can position it anywhere you like in your theme by calling its shortcode. For more information, please refer to our knowledge base: Currency Switcher Customisation. Thanks Diego, keep up the great work! Purchased. Buying it now simply because of Diego…honest stright answers…rare these days! is this plugin support MYR currency? The Currency Switcher can work with any currency, as long as an exchange rate is entered for it. Of course, the payment gateway(s) that you would like to use must also be able to accept it. 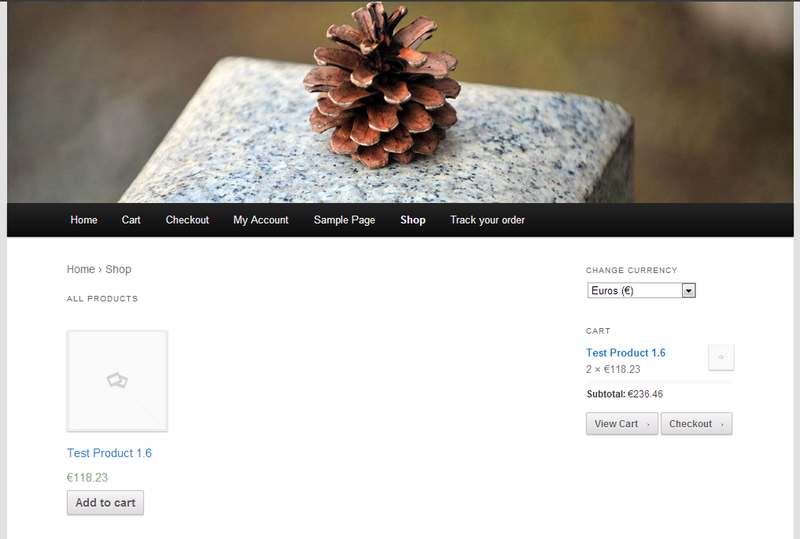 To add a custom currency, simply follow the instructions on WooThemes site: WooCommerce – Add a custom currency/symbol. He is very responsive and gave full attention to help me resolved the problems. Although it did not solved initially, he did not give up and reprogrammed specifically for me to work with other complicated softwares. Definitely a professional first class programmer. And just one more question: May I use it for more than one of my web applications after I have purchased it once? Yes. The Currency Switcher is distributed under GPL, therefore you can use it on as many sites as you like. The only restriction applies to the free support, which covers one site per purchase. It seems it is a great plugin! Before I buy it, I need to know if the currency BGN (Bulgarian lev) is in the scope of the plugin. Hi Veselina. The Currency Switcher can work with any currency, you will just have to make sure that you use a payment gateway that supports the currencies you would like to use. If you wish to add currencies that are not part of standard WooCommerce, you can easily do so as described in the following article: WooCommerce – Add a custom currency / symbol. My base currency is Rial, which is not supported by Paypal. If I use your plugin to also sell in Euro, does it enable the use of Paypal in woocommerce? Thanks for your enquiry. If you install the Currency Switcher, you can enable Euro as an additional currency. 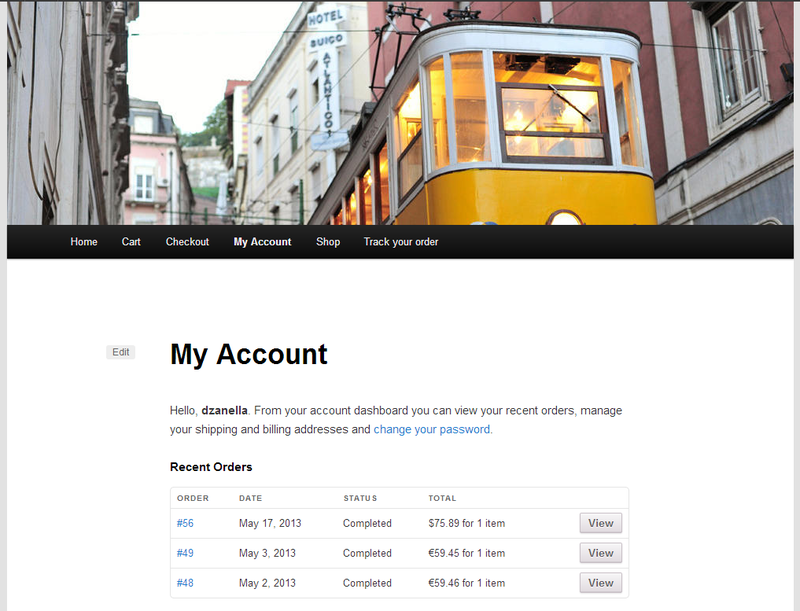 You will then be able to enable PayPal as a gateway for Euro (and other supported currencies). PayPal will still be disabled, though, for Rial, as the PayPal service itself does not process it. Great support. I really appreciate the work. The Currency Converter widget just alters the way prices are displayed, but this is just a cosmetic change. 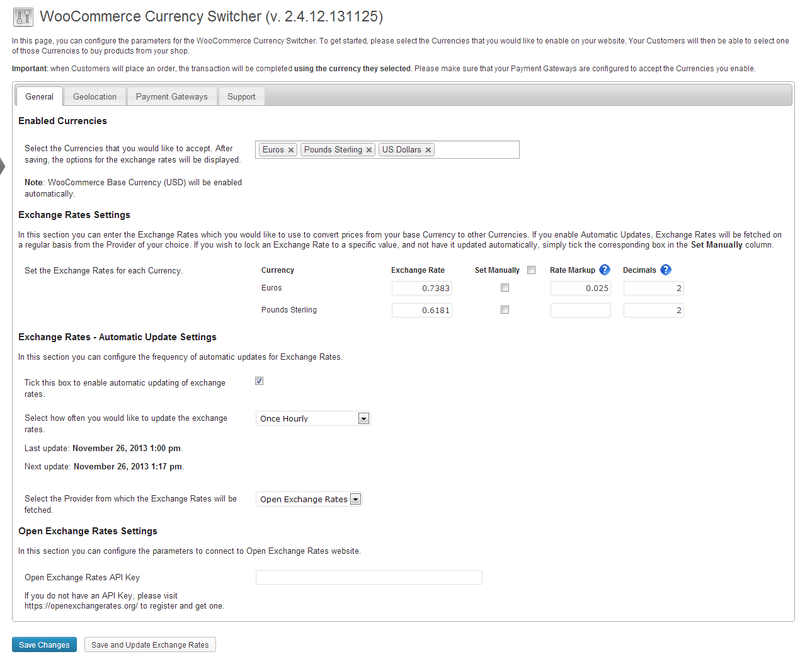 As the page you linked states: “with the Currency Converter widget, customers will still pay in your base currency. Prices are for display only”. The Currency Switcher, instead, allows customers to pay in the currency they have chosen. Also, the Currency Switcher implements several other features, such automatic currency selection based on Geolocation, entering prices manually, in different currency, for each product, setting custom exchange rates and markups, and so on. You can find more details on the product page, in the Key Features section. Thanks for your interest in the Currency Switcher. The plugin is really really great im very happy i find that !!! Great Support fastest on the world and exactly on point !!! What you wont more !!! Thank You Diego !!!!!! I was offered with the best product and the support!!! !Diego responded with the fastest support I have ever received!! I found the plugin is great. I can switch the currency on the fly in the sidebar. I also would like to know how to add the currency switcher widget to header? Thanks for your feedback. You can put the Currency Selector widget anywhere you like by following the instructions in the knowledge base: I would like to add the Currency Selector widget somewhere in my theme, how can I do it? Awesome support and great product. This has really fixed what i was after, giving the customer a choice of currency I feel is important. The fact that it auto converts from USD, AU or whatever depending where you are located is a real bonus. Nice work and highly recommended! Amazing support!!! Had a few issues implementing the plugin, but I was talked right through it in great detail. So helpful. Its a great little tool and I find it really useful. Solves a problem that so many people have that I can’t believe it has taken this long to create something like this! Amazing plugin! Haven’t found nothing better than this one for managing currencies in woocommerce. It perfectly does what it needs to do, easy to manage and support is great! Big thanks for author of this plugin! Exactly the extension we needed to remove the need for a full WPML implementation just to transact in two currencies. We have it hooked up with Paypal and our developer forked Woo to send USD transactions to our US Stripe account, and CA transactions to our CA Stripe account. Seamless and perfect with this extension in place. A pre-sales question to Diego was answered quickly and very completely. Highly recommended. Diego and the P2E team have filled a gaping hole in the e-commerce market with this plugin — and it really does what it says. The interface is very accessible in the back end and applying the filters for your clients is as simple as dropping in a widget to any widgetized area. I managed to tweak the CSS styling very easily to incorporate it into my theme. I’ve tested transactions into PayPal Standard and it passes the order in the currency selected in the front end. The other Woo (and WPEC) plugins don’t have this feature — excellent! Highly recommended and great support from Diego!